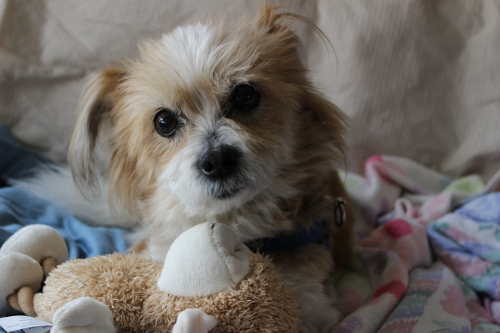 Tips on How to Keep a Senior Dog Healthy: Bean Bags, The Yellow Dog Project, and More. As our little Shih-tzu, Anakin, has grown older, we have had to make certain adjustments in our home to accommodate his changing needs. He is now considered a senior dog and so requires a bit more attention, both from us as well as the veterinarian. Like us, you too may be caring for a senior animal who needs just a bit more consideration at this time. With a few changes to your household, you can make sure that your furry little one is safe even as they grow older. One thing that we have noticed with Anakin, as with one of my other dogs, is that he has grown intolerant of changing temperatures. Allowing him to become too hot or cold would not be wise, and so we have made certain alterations to his lifestyle so that we can ensure his health. As this is a common problem with many elderly animals, you too may encounter this as your pets become older. Being a little more attentive to your pets' moods and symptoms can provide them with a more comfortable life during their senior years. For example, we walk Anakin at different times of the day depending on the season and temperature. Also, we often must snuggle him up in a blanket, such as the soft, washable fleece blankets sold by Ahh! Products, as he will become cold even during the summer months. Equally as important, we prevent him from becoming overheated; senior dogs and other animals are much more prone to heat exhaustion and stroke than younger ones. Even minor changes can allow your pets to have a bit more comfort during the day, no matter the heat or cold. Additionally, one issue that we have encountered in relation to Anakin's safety is his problems with mobility. He has not yet developed arthritis but often experiences complications in relation to coordination, possibly due to his previous surgeries and cancer treatment. Although he was once a spry little dog, it is a little more difficult for him to get around these days. Knowing this, we have had to make some decisions in regard to certain things around our home. As with the above changes, these were minor but could ensure his safety in the long run. One of the hardest things for us has been his desire to sleep with us at night. Previously, he has enjoyed sleeping in our bed and has had no problem jumping off the bed if he wanted some privacy; this is no longer the case with his current abilities. We have therefore been encouraging him to sleep in the same room with us but on his own bed. A bean bag for pets would be a perfect solution to our problem as he could have a soft, comfy bed that wouldn't require him to leap out of and possibly hurt himself. Too, it would be portable, and so we could easily move the bed from room to room, allowing him to be with us and still enjoy the comfort of a bean bag bed. Choose a high quality, washable pet bean bag bed with a removable cover. Again, this is a small change to our household but one that gives him the opportunity to feel like part of the goings on in our home. Finally, one issue that we found to be somewhat problematic with Anakin was his changing ability to interact with other animals and humans. When he was undergoing chemotherapy, the veterinarian recommended that we seclude him from contact with others due to his lowered immune system. Taking him for walks often required some maneuvering away from people with other animals so that we could protect him from possible infection. Unfortunately, this often proved difficult to do. I have since discovered The Yellow Dog Project, a group attempting to create a universal symbol—that of the yellow ribbon tied to a leash—for dogs that shouldn't interact with other animals for various reasons. By creating awareness of this problem, they are helping attentive pet parents to care for their animals. If you too have a dog that might need some extra space during a walk, then you might want to give a yellow ribbon a try. It would allow you to take your senior dog for a walk while still making sure he was comfortable emotionally and safe from unwanted interaction. Yellow ribbons tells people your pet needs his space! For those of us with a senior dog like Anakin—or possibly any elderly pet—we can do very simple things to ensure their safety both at home and outside. Making these changes doesn't require any special knowledge on our part, just an open mind and a careful eye toward our animals' comfort. And by taking advantage of products such as the Ahh! Products fleece blankets and bean bags, then you can make these changes that much easier for yourself. Just a little consideration toward the comfort of your elderly pet will make all the difference in their life . SPECIAL THANKS to guest poster, Krista, for this awesome article. We are sure your senior dog is super happy! He has a great Mommy!